MIDI Files are backing tracks used by singers and musicians. 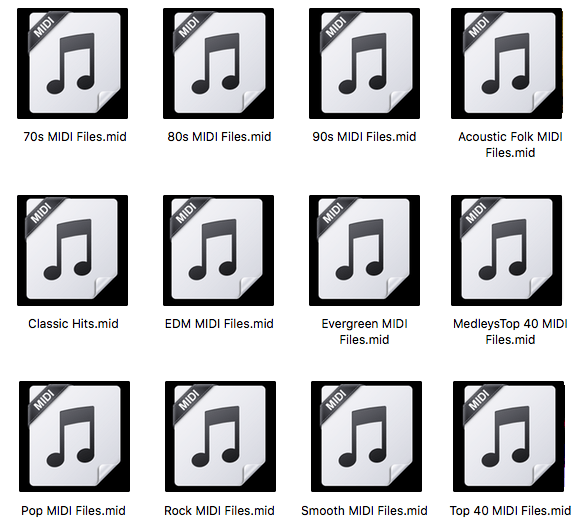 You might be surprised to know MIDI Files Backing Tracks (also referred to as MIDIfiles) contain no music at all. "M.I.D.I. (or MIDI) is short for Musical Instrument Digital Interface, a protocol developed in the 1980's to enable music electronic devices like synthesisers, drum machines, sequencing software and other digital musical devices to communicate with each other. MIDI Files are also known as backing tracks, especially among singers and musicians performing solo, in duos/trio's and even bands. Through the use of MIDI Files, music can be created in one program or app, edited in another, formatted to print sheet music, used in Karaoke and backing tracks and sent to other devices for playback. During the period before 1983, manufacturers incorporating MIDI in their musical devices used MIDI as an exclusive component for their devices. This occurred because in the early 1980's, a 'MIDI Standard' didn't exist. Musicians using two or more MIDI devices as part of a single composition tool were forced to purchase multiple devices by the same manufacturer. This was not an ideal situation, especially in a creative environment like music which often relies on collaboration. Today's MIDI Standard ensures MIDI devices communicate seamlessly from one manufacturers device to another. Modern music producers, musicians, performers and stage technicians owe a debt of gratitude to visionaries Dave Smith from Sequential Circuits, Chet Wood and Ikutaru Kakehashi from the Roland Corporation. Both Dave Smith and Ikutaru Kakehashi understood the need to create a MIDI Standard where electronic music instruments from all manufactures seamlessly communicate with each other. Thankfully, the original MIDI Standard proposed by Smith, Wood and Kakehashi led to General MIDI, a definitive MIDI specification that standardised the rules to create MIDI Files. Solo artists, Duo's Trios and even bands use MIDI Files. The MIDI format exposes artists to a wider variety of venues, specially those venues where room sizes are smaller and volume is a consideration. In these environments, performers can setup their gear easily, usually on compact stages or on the floor. Sound checks are often not necessary or can be done relatively quickly prior to or even during the performance. This is possible because MIDI File backing tracks are not as suspectable to room acoustics as live drums and other instruments. You might be surprised to know that major touring and recording bands often supplement their sound and stage functions using MIDI Files. It's not uncommon for bands to include MIDI File generated drum parts, percussion and effects, synth and keyboard sounds, orchestral and brass sections. Off stage, lighting, smoke machines, stage effects can also be controlled via MIDI in real time or by a MIDI File. A MIDI File, sometimes referred to as MIDI Files and MIDI, does not make sound. It is a data file containing messages like note on, note off, note/length, note/pitch, pitch bend, channel volume, channel reverb and so on played or recorded digitally on a MIDI sequencer. It is the playback device that interprets and transcribes MIDI data into musical sounds. To create a MIDI File you need an input device (MIDI keyboard or controller), a recording device/software (MIDI Sequencer) and a playback device (MIDI sound module or VST [Virtual Studio Technology] instruments). A typical MIDI input device might be MIDI keyboard, MIDI synthesiser/DAW, MIDI Guitar, a dedicated MIDI File backing track player and even wind devices like a MIDI Oboe. MIDI Files require a dedicated playback device to achieve full sonic potential. Remember, MIDI Files do not have any sounds. The MIDI File is a data file that sends on-off and controller variant commands to a receiving device or app. It is the receiving device or app which interprets the MIDI data to generate the sounds you hear. Popular devices include the MERISH Series made by M-Live Italy, Roland Sound Canvas and Yamaha Motif among others. 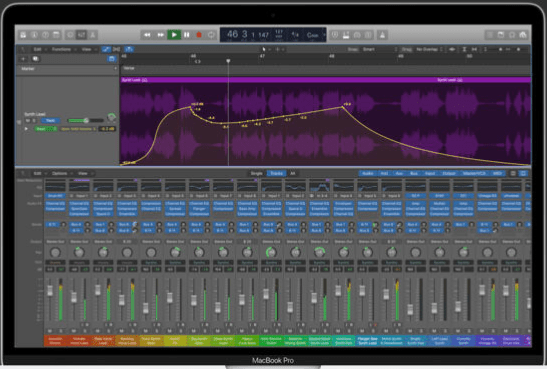 Popular MIDI recording software include Logic, Cubase, Pro tools, Sonar, Cakewalk and GarageBand. Most MIDI keyboard synths/DAW (Digital Audio Workstation) include an internal MIDI sequencer. Devices like Yamaha MIDI Files and Roland MIDI Files are standard MIDI Files with a brand name. A MIDI File has 16 channels. Each channel controls the playback of a instrument sound (often called a 'patch'). A typical MIDI File may look like this ('Ch' = MIDI Channel'). Note I highlighted four MIDI channels with * . General MIDI (GM) protocol dedicates those channels for a specific purpose. Channel 2 is devoted to bass. Channel 4 is the melody guide, channel 5 for vocal harmony guide and channel 10 is the dedicated drum channel. MIDI Files are used around the world by singers, entertainers and musicians performing solo and in small/large bands as backing tracks or to add additional instrumentation to a live band.